BACKGROUND: Mammographic screening programmes are now established in developing countries. We present an analysis of the first screening programme in sub-Saharan Africa. METHODS: Women aged >40 years were identified at three primary healthcare centres in the Western Cape Province, South Africa, and after giving informed consent underwent mammography at a mobile unit. After a single reading, patients with American College of Radiology Breast Imaging Reporting and Data System (BIRADS) 3 - 5 lesions were referred to a tertiary centre for further management. RESULTS: Between 1 February 2011 and 31 August 2012, 2 712 screening mammograms were performed. A total of 261 screening mammograms were reported as BIRADS 3 - 5 (recall rate 9.6%). Upon review of the 250 available screening mammograms, 58 (23%) were rated benign or no abnormalities (BIRADS 1 and 2) and no further action was taken. In 32 women, tissue was acquired (biopsy rate for the series 1.2%); 10 cancers were diagnosed (biopsy malignancy rate 31%). For the entire series of 2 712 screening mammograms, the cancer diagnosis rate was 3.7/1 000 examinations. Of 10 cancers diagnosed at screening, 5 were TNM clinical stage 0, 2 stage I and 3 stage II. CONCLUSION: The low cancer detection rate achieved, and the technical and multiple administrative problems experienced do not justify installation of a screening programme using the model utilised in this series. Mammographic breast cancer screening has reduced the mortality from breast cancer in the screened population by up to 65%. Most First-World countries have therefore introduced mammographic screening programmes. Plans are afoot to establish mammographic screening in 'resource-enhanced' settings in the developing world, including in northern African countries such as Tunisia and Egypt. [3,4] We present an analysis of the first mammographic screening pilot programme in sub-Saharan Africa. Patients of screening age (>40 years) were identified at three primary healthcare (PHC) centres in the Cape metropolitan area. The women were then informed about the benefits and risks of screening and underwent mammography. Mammography was performed by certified mammographers in a mobile breast-screening unit run by a corporate social responsibility organisation (Pink Drive, Cause Marketing Fundraisers Pty Ltd, Johannesburg, South Africa). The unit was equipped with a Giotto mammography machine (Internazionale Medico Scientifica, Italy); the images were processed in a Konica computed radiography processor (Konica Corporation, Japan) and printed onto discs. Discs were then batch-read at a private radiology practice by one of two radiologists and classified according to the American College of Radiology Breast Imaging Reporting and Data System (BIRADS). Those women whose mammograms were reported as BIRADS 3 - 5 were referred to a tertiary centre for further work-up where the mammograms were entered into a picture archiving and communication system and reviewed by a team of experienced breast surgeons and radiologists, and a management plan was established. For patients with confirmed malignancy, the following data were recorded: age of the patient; stage of the cancer according to the TNM staging system; type of cancer; and further management. Cancers were regarded as symptomatic if the patient had sought the attention of the PHC centre for a mass in the breast, and true screening if the patient had visited the PHC centre for unrelated reasons or for breast cancer screening specifically. Between 1 February 2011 and 31 August 2012, 2 732 mammograms were performed. Following technical failure of the mammography machine, no mammography was performed in April and May 2011. Of the total, eight patients were aged <40 years and excluded from the analysis. With the remaining 2 724 mammograms, 12 were done in women presenting for a mass in the breast, leaving a total of 2 712 screening mammograms for analysis. Of the mammograms referred for further work-up to the tertiary centre, 51 done on patients at the beginning of the series were regarded as of such poor quality that they were not suitable for interpretation, and the patients had repeat mammography performed. Eleven mammograms were not made available for review and 14 patients could not be contacted to return for work-up; these women were not seen at the tertiary centre for further evaluation. Upon review of the 250 available screening mammograms, 58 (23%) were rated 'benign' or 'no abnormalities' (BIRADS 1 and 2) and no further action was taken. For the entire series of screening mammograms (N=2 712) the cancer diagnosis rate was 3.7/1 000 examinations. Of 10 cancers diagnosed at screening, 5 were TNM clinical stage 0, 2 stage I and 3 stage II. 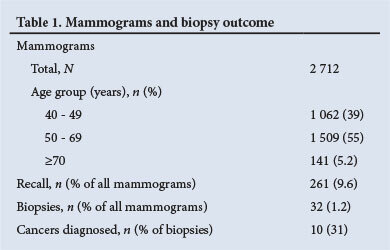 The number of mammograms and the biopsy outcome is reflected in Table 1. Two North African mammographic screening programmes from Tunisia illustrate the difficulties of mammographic screening in a developing country: a low participation rate; and performance indicators falling short of the established screening programmes in Europe. [2,7] The methods employed, however, seem to have been sound; as illustrated, for example, by the employment of double reading and collection of data for key performance indicators. We are not aware of any report on the Egyptian screening effort in the accessible scientific literature. The mammographic screening programme described in this paper is best classified as 'opportunistic' or 'community' screening as it does not fulfil a number of the essential criteria for 'organised' screening as described by the World Health Organization. Multiple areas of concern arise out of the large number of mammograms deemed unsuitable for screening purposes: the technology used by the screening effort was not appropriate for mass screening; and the transfer of images between different systems may have compromised image quality. (An improvement in the image quality was noted after radiographers from the tertiary centre visited the mobile unit and corrected radiographic technique, but quality still did not reach standards expected of modern digital systems.) As the authors saw only mammograms referred to the tertiary centre for work-up, questions remain concerning the quality of the 90.4% of mammograms reported as BIRADS 1 and 2 and consequently not seen at the tertiary centre. Several factors cast doubt on the quality of mammography reading: the lack of image quality was not recognised and corrected by the primary readers of the screening mammograms; a large number referred patients' mammograms were re-reported as BIRADS 2 (benign finding) when read by the experienced team at the referral hospital; and the cancer diagnosis rate was far lower than achieved in a tertiary centre in a similar population and reported by a private clinic in the same geographical area. While inter-observer variation is a well-documented reality of mammographic screening, the large variation in this series, especially with respect to clinical management implications, is concerning. A reason may be the lack of a second reading, which is an essential part of mammographic screening programmes. A hallmark of a successful screening programme is the diagnosis of early cancers, as evidenced by a high proportion of in-situ cancers, a high proportion of node-negative cancers and a high proportion of infiltrating cancers <1 cm in diameter. Based on the experience of the two other series reported from the same area,[10,n] we would have expected about 20 - 25 breast cancers to be diagnosed in the 2 712 asymptomatic women screened in this series. With the low number of cancers diagnosed in this screening programme, any comments on this central aspect of mammographic screening are pure speculation. A final critical concern is that 11 mammograms (4.4% of the screening mammograms read as BIRADS 3 - 5) were not received by the tertiary centre. This indicates serious deficiencies in the administration of the programme and constitutes a major potential medico-legal liability. Breast cancer screening, as performed in this series, cannot be supported in a resource-limited environment such as our own and elsewhere in sub-Saharan Africa.